Lighting-Gallery-net - Fluorescent - T-12 and larger/GE Optimiser Lite White lit up! GE Optimiser Lite White lit up! At ricksbulbs' advice, I lit this up on a low power single lamp preheat ballast. Works, though this particular specimen struggled to start. The second Optimiser lit with no issues. Which preheat ballast did you used, Dave? What does the "M" mean? Lite white reminds me of a brighter vegetable green. 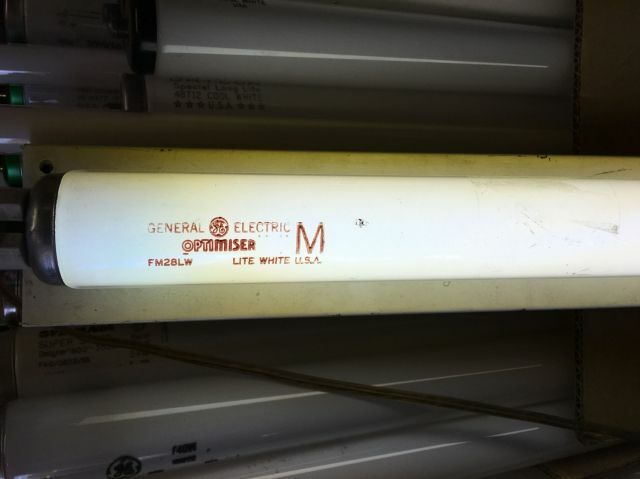 A GE low power 30/40w single lamp preheat ballast. Oh, I don't know what M means. the M means the lamp is an Optimiser. It was used to allow instant recognition if the lamp etch was visible from the floor so you would use the FM 28 lamps. Later ones didn't have the M. Some also had black etches later on. Told'ja so on running on a preheat ballast! Something tells me any 40 watt preheat ballast including Tulamp and HPF single will run these without protest, and probably at more like 35-40 watts. The 25 watt home shop light tubes were actually lower wattage than the FM 28 lamps, and will run on PH and work like regular F 40 in my observations. I have used up a bunch of these lamps in PH fixtures and they typically have HALF or less the life of regular F40. Funny, as the FM 28 lamps seem to last forever on a PH ballast. Makes you wonder, especially since GE did shady things for many years, they are the Greedy Extortionists after all! Yeah, Lite White is an odd bird, when used with cool white, it looks similar but not the same. The color rendering is AWFUL. I have ni idea why they even used this crappy phosphor and sold it, Dave, any ideas? Maybe it was a bit more efficient? Anyway, there ya all go----my experience with FM 28 on preheat ballasts confirmed. Rick D.
Probably 'Miser' with a big 'M', lol! since these are only 28w instead of 34w. Wonder what the lamp voltage is on these? Lite White is 49CRI, 3900K. With halophosphate lamps the lower the CRI the higher the LPW, hence why deluxe lamps like /950 or /CWX are dim. Lite White 34w 4', 60w 8' etc. lamps were supposed to be as bright as their cool white full-wattage counterparts. So do these "M" lamps have krypton if they run at reduced wattage on a full power PH ballast? I didn't see any striations from this when I lit it up, and it was a bit cold and starved. I'd like to see how it starts? I never knew these things existed. I dont fremember seeing these used anywhere. Great rare lamp you have. I think I found a ballast on ebay for this.